A guide to Poldark's Cornwall, real-life locations for you to visit from Ross Poldark and Demelza, the first two books in Winston Graham's Poldark series. 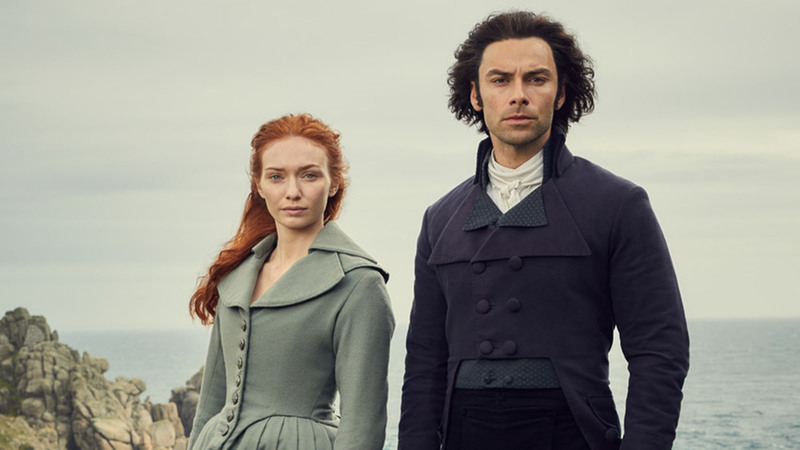 Ross Poldark is once more, the star of the literary world. Following the BBC adaptation of the Cornish drama, there is a renewed interest in the Winston Graham books first published in the 1940s. So what better time, to bring Ross back into our lives with a little literary pilgrimage of sorts - a booktrail to Cornwall - to visit the literary locations of the first two books in the series - Ross Poldark and Demelza. The story starts in 1783 and takes us up to 1787. The Cornwall of this time is a community largely reliant on mining for its survival. Ross’s copper mine is the only thing he has left. On his way home Ross passed the engine house of Wheal Grace, that mine from which had come all his father’s prosperity and into which it had all returned. Tressiders Rolling Mill and Ross Poldark’s Wheal Leisure are both fictional but Tressiders was recreated at Levant Mines and Wheal Owles and Crowns near Botallack stood in for Ross Poldark’s Wheal Leisure. The countryside around here is stunning. After a hard day’s work at the mine, Ross would ride home, along the rugged cliffs, the rough Cornish sea lashing the land below. From the cliffs and coves at Porthgawarra to the beach at Church Cove, Gunwalloe, Poldark country comes to life. Church Cove was the TV setting for the shipwreck scenes ironically next to Dollar Cove, which was the site for many real life famous shipwrecks. When the sun catches your eye, you may be able to see someone bathing down below. Good. Hold on tight as we’re headed off the harbour to see if the fish are in yet from the boats. The fictional harbour of Truro was recreated at Charlestown near St Austell. You can imagine Ross walking along the sea wall, Demelza wearing her new cloak and the ribbon Ross gives her to tie back her unruly mane. Out onto the rolling hills and open spaces of Bodmin Moor. The home of fictional Nampara, Ross’s home - actually an old farmhouse in St Breward. You could well bump into Jud and Prudie here for they never seem to wander far. Down the coast to Padstow and the setting for Nampara Cove. The beaches of Tregirls and Porthcothan are those spotted on the television version. Rugged cliffs, dramatic spots for looking out to sea and spotting anyone bathing in the lush blues waters below. This area was used to represent the Nampara Valley, which is part of Poldarks’ family estate. It’s also believed to be part of the inspiration for the fictional village of Sawle featured in the books. And there is an aptly named street here, which Winston Graham kept in his work. Trevaunance Cover sits at the end of the lane and reveals yet another Poldark moment although instead of ‘gaunt fish packing houses’ there are now cafes, Cornish ice creams and nice sand on which to sit and read the Poldark novels. A stop here before heading back to the mines for another day’s hard labour. It’s the town where Winston Graham lived and worked. His inspiration took him far and wide and showed us a Cornwall we still know and love today, and Perranporth is still at the heart of Poldark country. Along the beach at low tide, stroll to Flat Rocks, where there is a seat and a memorial plaque to Winston Graham on the cliff. His writing chalet stood here but has sadly since burnt down. Truro in the old days had been the centre of life for him and his family. A post and a coinage town, the shopping centre and a meeting place of fashion, the town has grown rapidly in the last few years. A secretive, important little town, clustering in the old of he hills astride and about its many streams, almost surrounded by water and linked to the rest of world by fjords, by bridges, and by stepping stones. The Booktrail.com is a literary travel agency helping you to travel to destinations all over the world via fiction. Choose a book, see where it's set and then visit the locations literary style. Or choose a destination and see which books are set there. Fuel that wanderlust and book that holiday! Find more Poldark locations here or for more book trails visit www.thebooktrail.com. Ross Poldark, Demelza, and the rest of Winston Graham's Poldark series are out now in Paperback and Ebook. Want to get started? Check out our post of all the Poldark books in order! Why not listen to these audio snippets while you tour Poldark country? The rich mining heritage of the stretch of west Cornwall coast linking Botallack and Levan was used as a film location in Poldark. Cameras rolled with Levant Mine playing the role of the fictional Tressiders Rolling Mill while Owles and Crowns near Botallack stared as Wheal Leisure. Church Cove Gunwalloe on The Lizard relived its smuggling past when Aidan Turner and a hoard of other cast members and extras descended to film night-time ship wrecking scenes. Bodmin Moor was used as a film location in Poldark. Scenes featuring the exterior of Ross Poldark’s cottage, Nampara, were shot on the Moors along with many capturing the cast on horseback. With a rugged character and wild streak, Bodmin Moor provides the perfect backdrop to Poldark’s plot of passion and family dramatics. The wide sandy beach of Porthcothan, near Padstow, stars as Poldark’s fictional Nampara Cove.